How do you keep online students enthusiastic about your class? A cat with no eyes, no ears, no mouth, no arms, and no legs. Don't worry - that wasn't a really bad joke. 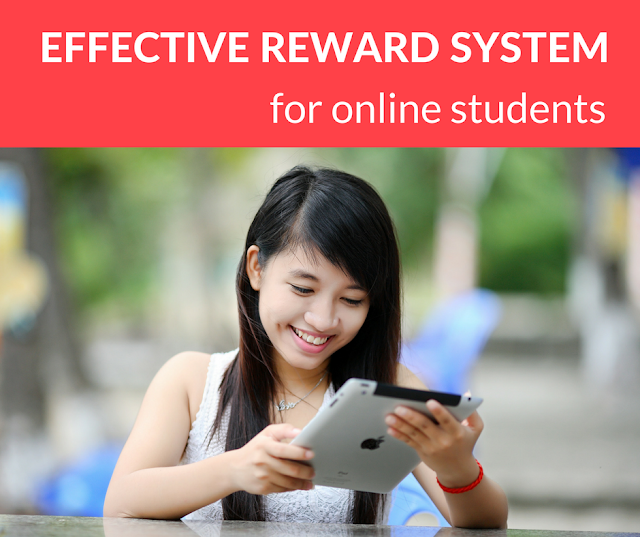 It's a kickass reward system for your online students. If you don't teach online yet, check out Dada ABC. They pay up to $25 an hour and are a great company to work for - from your own home! Awww yeah. Some teachers make intricate reward systems with laminated sheets and moving parts on string - and that's amazing! But using an empty cat is an amazingly effective and incredibly easy reward system for any online teacher. It takes seconds to set up and most students adore it. You know when you give a small kid the latest fancy toy to play with and then they spend hours pretending to be an astronaut in the box? Yeah... sometimes simple things are best. Fold a piece of A4 paper into four quarters. This one piece of paper is good for four classes. 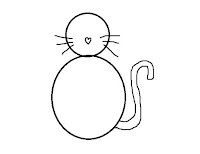 Step Two: draw an empty cat. Draw a round head and body in one quarter. 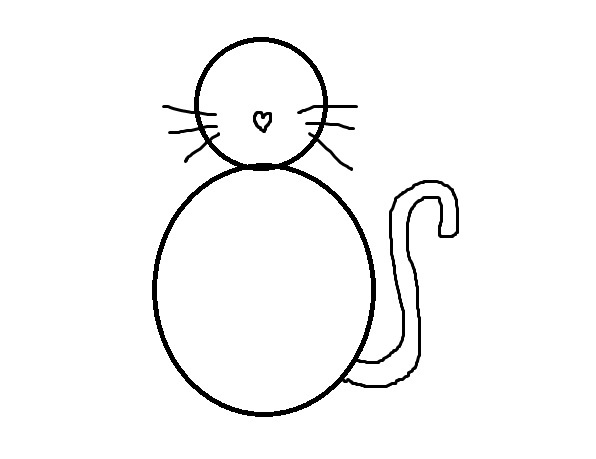 Add a love heart shaped nose, six whiskers, and a tail. Easy. Fast. Super cute. Step Three: show the empty cat. Say hi to your student like you normally would. Suddenly, look shocked and confused. "Oh! Oh my... what IS this!?" Show your empty cat to your webcam. Step Four: ask what's going on. Sepending on your online student's ability, they will either say nothing at all or say it's a cat. Respond like this: "Yes, this is a cat! But... oh no... what is missing?" Depending on your student's ability they will either say nothing, say "EYE!" or something similar, or give a comprehensive list of all the missing cat parts. Step Five: explain your reward system. "When you try very hard in class today, we will draw on the cat!" Hold up a pen and mimic drawing. "We will draw together. We will draw eyes, ears, mouth, hands, and legs!" Sometimes they don't have a clue what you just said, but sometimes they do. Get into your teaching groove as soon as you finish explaining. Step Six: draw cat parts on the empty cat. Dada ABC teachers can reward up to five gold stars in every class for good English or good effort. Whenever you reward your student with a gold star, say, "Yayyy! Let's draw the cat!" Draw one cat part every time you give a gold star, e.g. two ears the first time, two eyes the second, one mouth the third, and so on. How involved your student gets depends on their English ability. If your student is capable you can ask things like, "What shall we draw first?" You can ask for further input if your online student is up to it: "Is the cat happy or sad?" and draw the mouth according to their answer. "Big ears or small ears?" Get creative! It should take less than 10 seconds to draw each cat part. Talk about each cat part you draw: "How many eyes?" or "Is he cute or ugly? ", etc. Step Seven: who IS the cat? when class is almost finished and you just drew the last cat part, talk about the finished cat. What is his name? How old is he? Why is he happy? Whatever you want! Obviously, you can adapt the empty cat reward system for each online student's preference. If you don't know already, ask what their favourite animal is so you can draw an empty version of that instead. It could be a dog, a dolphin, a horse - anything. Can't draw well? No worries. It's surprisingly easy to draw animals when you think about them as just shapes. A cat is two circles. So is a dog. A hamster is just a cloud shape with a smiley face and round ears. Cat ears are just triangles and dog ears are just soft banana shapes. Even if you do a bad job your students will love it - they'll probably just laugh and have fun with you about your wonky cat! Google-search "simple clipart hamster" or "simple drawing dog" for all the guidance you need! 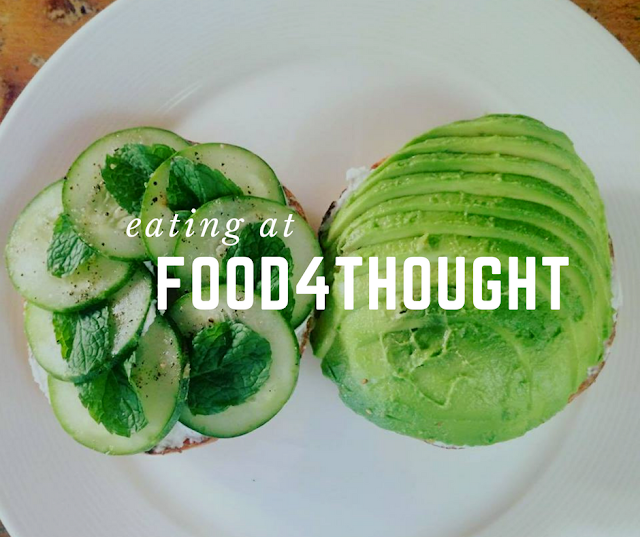 Let me know if you try this and love it! Which empty animals do you love drawing? Make money for travel. Teach English online with Dada ABC. Fancy ditching your drab life to travel the world, but don’t have enough cash to buy a plane ticket? Dada ABC is a massive online education platform for one-on-one English teaching to Chinese kids aged 5 to 16. They’re partnered with big-deal businesses like National Geographic Learning, Pearson, and Penguin Random House. They’re an awesome company to work for. The best thing about Dada ABC is that they pay up to $25 an hour for genuinely rewarding work. You can teach from anywhere in the world with a decent internet connection – in your home, in Bali, in Croatia, in Japan - wherever you feel like exploring next! Sounds sweet, right? 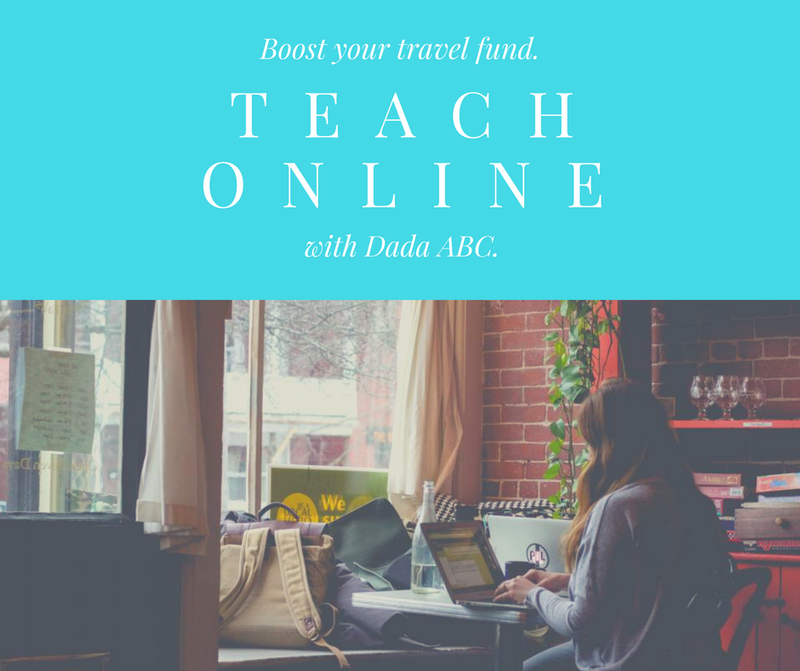 This post is dedicated to explaining how you can make money for your travel fund with Dada ABC. What are Dada ABC’s requirements? You gotta be a native English speaker with a uni degree in any field. You need a computer, a good internet connection, and a headset. 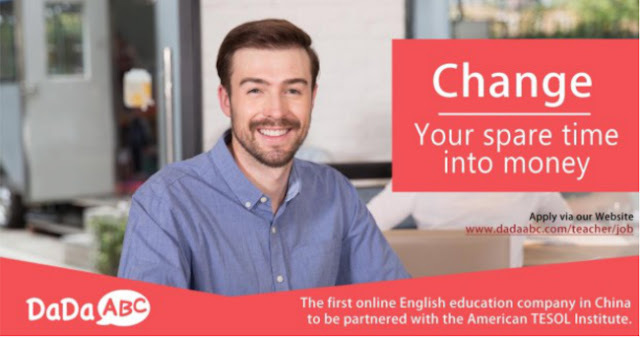 Unlike, well, pretty much ALL other teach-English-online companies, you don’t have to be Northern American. Let me hear ya, native-English non-Americans! 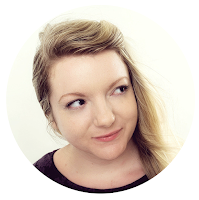 What’s it like teaching with Dada ABC? Seriously guys, Dada ABC classes are so fun and stress-free. If you know me, you know I’m not the kind to gush over how cute kids are. There has to be a lot more going on than just a cute face staring back at me before I feel fulfilled. Student English skills start from absolute beginner to pretty much fluent. So, in one class, you’ll be teaching AH AH APPLE! BUH BUH BOY! and in the next you’ll be having a deep conversation about what you would wish for if you could have one wish come true. Gotta be honest, I love those deeper interactions more – but seeing the beginners improve over time is incredibly rewarding, too. Classes are 14 or 30 minutes long, depending on the kind of class you’re teaching. Each class is one-to-one and taught inside a virtual classroom with pre-made slides and interactive tools. Yep – you don’t have to create your own teaching materials! Everything is done for you so you can focus all your energy on being a kickass teacher. You see your student inside a little screen next to the slides, and they see you. There is a countdown timer so you can see exactly how long you have left in class. You’re given a virtual treasure chest of five stars per class. Whenever your student does something ace or needs encouraging, you can click on a star to unleash it into the classroom. Those kids really love the stars! Depending on your teaching style, you can draw, play games, use puppets, sing songs – really, you can try out any teaching idea! If you’re not really a puppet-and-singing kinda person, that’s OK - ask imaginative questions, draw, play games, and enjoy plenty of free-flow conversation based on the topic you’re studying. Dada ABC strongly encourages total physical response teaching style. • Log in to Dada ABC at least ten minutes before your first class. • Enter the virtual classroom. You get a thumbs up if you enter 30 seconds early. • Say hello to your student. Introduce yourself if they’re someone new. Make ‘em smile – if your student loves you, they’ll learn more! • Do a fun warm up activity tailored to the student’s ability. • Teach based on the slides. • Ask them to read, sound out letter sounds, listen and circle the correct word, copy pronunciation, play English games, etc. Ask concept-checking questions to ensure they understand. Elicit more than teach – get them to practice speaking, spelling, and reading as much as possible. Make them laugh! • Review everything you just learned together. • Write a 150-word lesson report within 24 hours. After teaching there for a week or so you’ll have regular students. You’ll see them at the same time every week. Watching their English improve is incredibly rewarding. How many hours can I teach at Dada ABC? You can teach as much or as little as you like, so long as you teach at least two hours twice a week. Dada ABC’s main teaching hours are Beijing-time 6pm to 9.10pm Monday to Friday, and pretty much all day Saturday or Sunday. Amazingly, you set your own schedule – so if you don’t want to work weekends, you don’t have to! Most Dada ABC teachers set their contract hours at three hours a day, Monday to Friday. It’s a cinch to apply for temporary part-time hours if you need a little extra cash that month, too. Once Dada ABC have your schedule, they’ll send students your way. You don’t have to do anything – just wait for them to appear in your timetable. What is Dada ABC’s hourly rate? Your Dada ABC hourly salary is based on your teaching experience and how well you perform in your interview and demo class. If you have loads of teaching experience and you nail the onboarding process, you’ll be offered a higher hourly rate than a newbie - but even newbie salaries are nothing to scoff at. Your salary is reviewed each time your contract is renewed. Max salary is $25 an hour. Unlike most teach-online companies, Dada ABC pays half time for your contract hours even if you have no class in your schedule. You just have to be logged into the system. I think it’s great that they recognise this time is still time out of your day – who wants to be paid nothing for waiting around when you could be out doing fun things instead? They offer monthly bonuses and contests to boost up your salary, so most months you can earn more than your base salary. There's a big bonus at Christmas for not taking any days off, for example! You are paid by the 15th each month via PayPal or into your bank account. How can I get hired at Dada ABC? If you impress your interviewer, you will be offered an hourly rate and asked to confirm your teaching schedule. If you accept, you can sign the contract and begin teaching as soon as possible. Initial contract lengths are 6 months or 1 year. Good luck if you decide to apply for DadaABC! Learning Thai is hard. These videos make it easier. Are you trying to learn Thai? I am. I'm studying Thai at Chiang Mai University, and it's wonderful and frustrating in equal measure. It's worth it, though. I love being able to chat with Thai friends, read Thai signs, and understand when Thai people are talking about me when they think I can't understand (mwahaha!). Finding reliable, effective resources to learn from can feel impossible, especially when you just want to get on with it. You can waste a lot of time filtering out all the useless stuff if you don't know where to look: the videos that have a great title but are actually too complicated, too fast, or too carelessly thrown together. The websites that make grand claims but are so boring and tedious. Also, I don't wanna learn textbook Thai unless I'm studying reading and writing. I want to speak Thai like how Thais speak it! 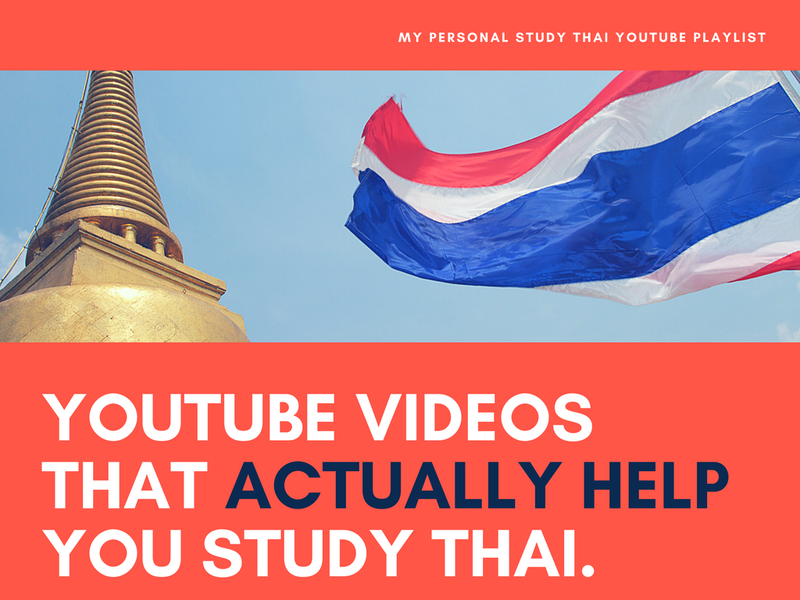 To save you wasting hours trying to find the good ones, here's a list of all the YouTube videos I actually use to study Thai. Over the past year, I've watched a lot of YouTube videos that promised to help me. The videos that made the cut below are genuinely useful and easy to study with (though that purple cricket haunts my nightmares). It's a short list, but that's coz I'm really picky. I highly, highly, highly recommend studying Thai with a real-life teacher. I don't recommend you try to learn Thai using YouTube videos alone - I just don't think it would work. It's beyond the scope of YouTube study videos to go into detail about the nuances of Thai language. Nothing beats being in-person with your Thai teacher. 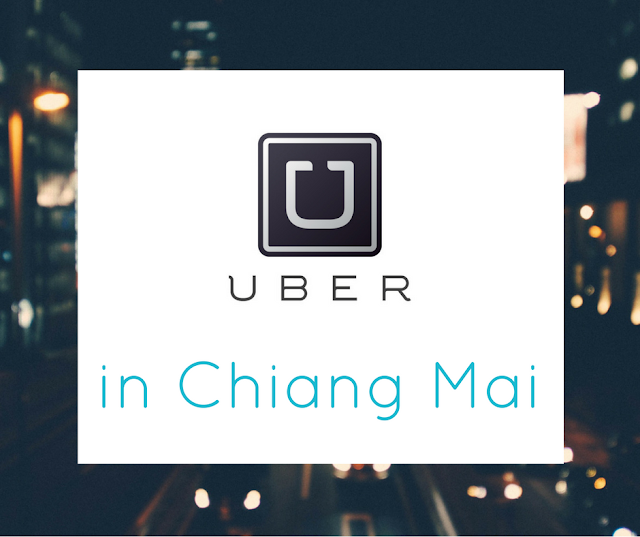 Read what it's like studying Thai at Chiang Mai University here. This YouTube video has a consonant song, consonant story, consonant test, vowel practice, a very brief tones introduction. The song and character voices are incredibly annoying, but it's one of the best resources I've found. You, the listener, are referred to as 'Kun Nu Nu', which means little mouse. Because at this stage of learning Thai, you're a little mouse just starting out, geddit? Start the video at 34:53 minutes in to learn numbers. The list below is missing เอียะ, อัวะ, and เอือะ. If you have an easy video for them, please tell me in the comments section! This video of Pororo the Little Penguin is super blurry and a bit laggy, but very useful. Basic vowels start at 3:58 and vowel clusters start at 26:30. You've no doubt seen the meme going round about the importance of English grammar: it's the difference between helping your uncle, Jack, off a horse, and helping your uncle... yeah, you know where this is going. In Thai, tones are as important as English grammar. Sentence meaning changes SO MUCH if you get it wrong. Watch the video and you'll see what I mean. ThaiPod 101 is really great at teaching vocab and useful phrases, especially at beginner level. I particularly like to use Learn the Top 15 Thai Questions You Should Know to review question words. Remember how I said videos can't teach you the nuances of Thai language? It's important to bare that in mind when watching ThaiPod101. For example, some question words go at the end of a sentence, and some don't. You'd know that if you studied Thai or spoke Thai with a Thai friend, but you could easily miss it in the video because sentence order isn't explained. English sentence order: Where is the bathroom? Thai sentence order: The bathroom is where? - hong naam tii nai? English sentence order: Why do you like pad Thai? Thai sentence order: Why do you like pad Thai? - tammai kun chorp pad Thai? English sentence order: What is your name? Thai sentence order: Your name is what? - Kun chue arai? But my teacher says that chan is elitist and old-fashioned. These days, women only say chan when they are placing themselves socially above whoever they're speaking to. Since that's kinda rude, we should say our first name or nick name instead. Khru Mod is my favourite YouTube teacher to learn REAL Thai from - the Thai that Thai people actually speak to each other! Check out 10 Common Thai Interjections, Thai Lesson: 12 Most Common Mistakes, and Thai Lesson: Useful Thai Words and Phrases for Party! to see what I mean. I especially like when Khru Mod teams up with Khru Pear in Mod & Pear Videos. Khru Mod has a YouTube channel and website. Most of her videos are about quite basic topics, but personally I think you need a little bit of understanding about Thai language before watching, like basic vocab and sentence structure.